It is better to not even begin playing the game, as it will only lead to suffering and misery. Plus, last time I played Hegel ended up winning, even though he totally didn't deserve it. Epictetus was an ancient Roman Stoic philosopher. Like the Stoics before him, and most of the Greek thinkers, Epictetus's thought was closely tied to how to live the "good life". This meant being virtuous and free from pain. For Epictetus, how to do this was to come to the realization that anything outside of your control must be accepted, and couldn't harm you unless you let it. He meant this in quite an extreme way, even saying that the loss of loved ones can't and shouldn't cause you suffering, because their death was part of their existence all along (i.e. they were always going to have died, so when it finally comes it should be taken simply as a part of reality). He even wrote more practical guides to how this might be achieved, such as imagining to yourself that they die every day, so when it comes to be you are mentally prepared for it. 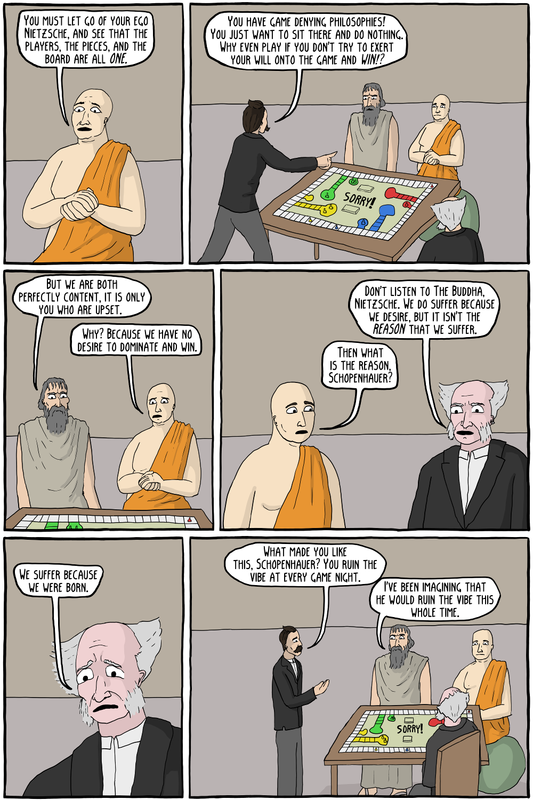 Of all the Greek philosophers, the Stoics were probably closest to Buddhism (although there is no evidence that either knew of each other), in that they emphasize the acceptance of reality in order to eliminate suffering. 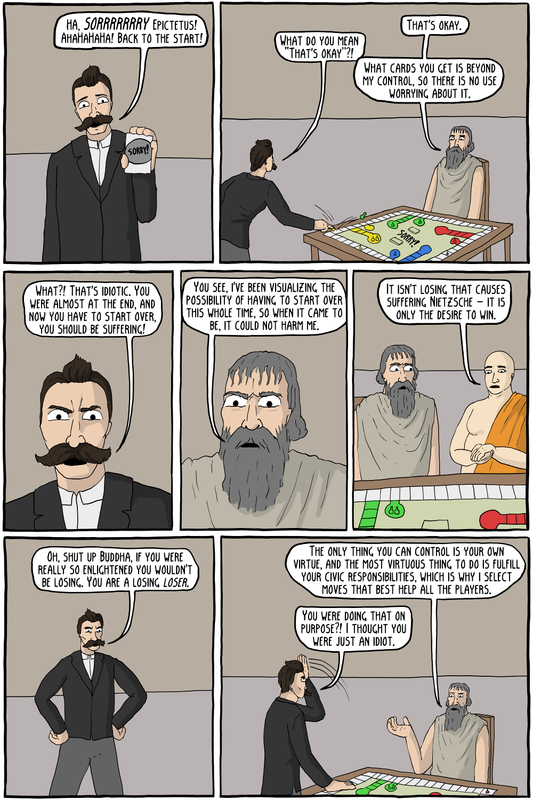 While Nietzsche admired both the Stoics and Buddhism in some ways, he was also critical of both, claiming that they were nihilistic, life denying philosophies (although his understanding of Buddhism in particular was probably not very good, due the materials available to him). Not only that, but he claimed they were inherently contradictory. He said they didn't actually "accept things as they were", but willfully strode towards the Stoic or Buddhist good, which was contructed by them. Schopenhauer was one of the western philosophers most influenced by Buddhism (although like Nietzsche, he probably didn't have the most accurate account of it available to him). He mostly accepted their ideas about how suffering was caused by desire. However, unlike the Stoics and Buddhists, he was much more pessimistic about there existing a solution to this situation. He felt that ultimately humans were creatures entirely composed of a will towards something, and that would always cause suffering when it wasn't fulfilled, or boredom when it was. He thought then that humans must suffer, and was one of the first to commit to the antinatalist position, claiming that humans were better off never existing at all. Sorry! is a board game where the goal is technically to get all your pieces to the "home" area, but most of the enjoyment comes from inflicting suffering on your opponents by knocking them back to the start at the last possible moment.